This is an easy recipe for egg-less dark chocolate beet brownies. 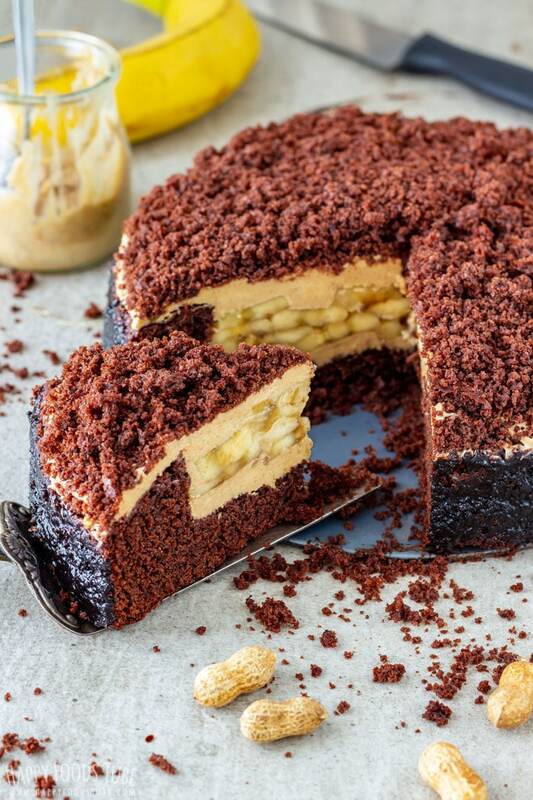 Slightly healthier alternative to the classic sweet treat that everyone loves! 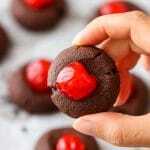 Pureed beet keeps these dark chocolate beet brownies moist and apple puree (sauce) is added instead of eggs. 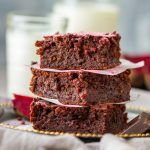 Are dark chocolate beet brownies healthy? 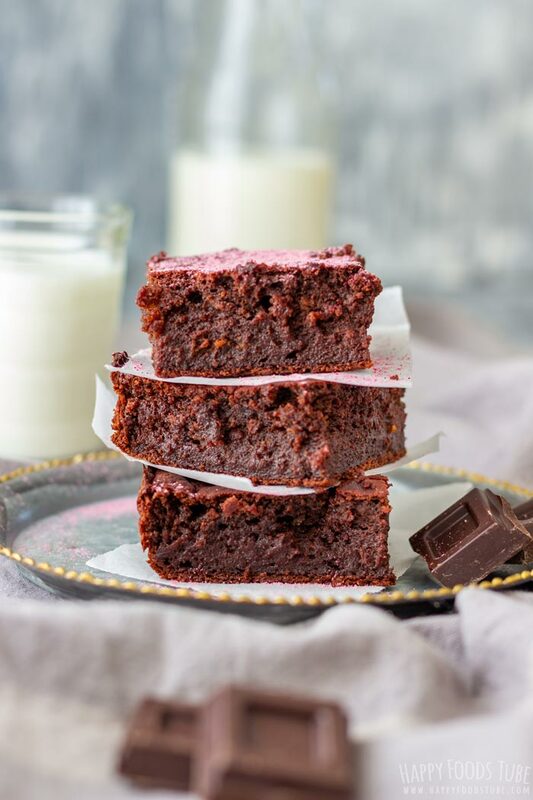 They are definitely healthier than your ordinary brownies thanks to using high quality dark chocolate with 70% cocoa content as well as adding pureed beet to the batter. 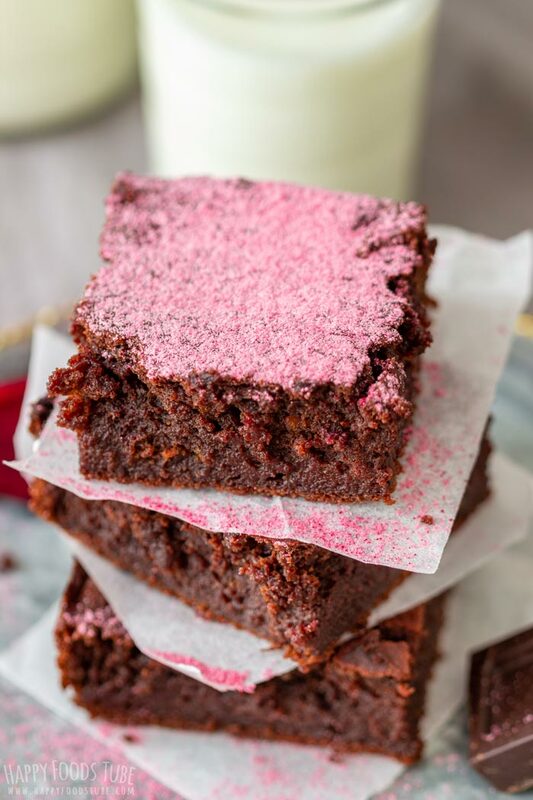 The amount of refined sugar in this recipe is kept to a minimum as beets and apple sauce will add to the sweetness of these brownies. Melt the chocolate altogether with butter. When this is ready, stir in the sugar and set it aside. Now puree the beet. I always cut it into small pieces so it’s easier to process. The next thing is mixing together the dry ingredients – flour, baking powder, baking soda and cocoa powder. After you just add apple puree, pureed beets and melted chocolate and mix everything well. 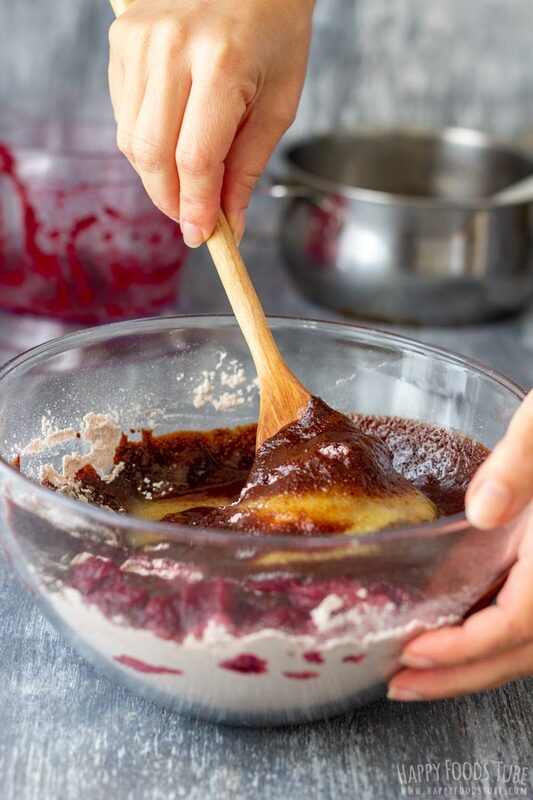 Pour the batter into a brownie pan lined with baking parchment and bake! 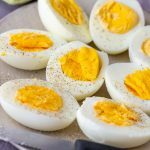 Make sure that you let them cool down before slicing them. 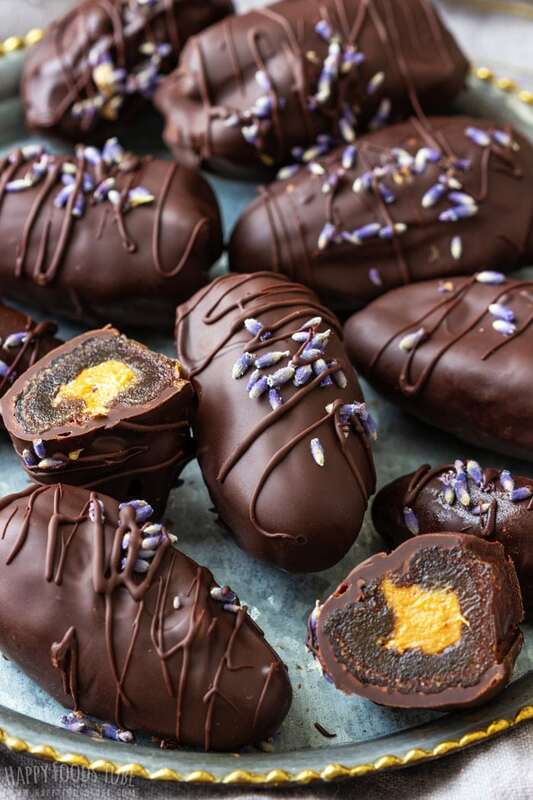 Chocolate Covered Dates are my favorite and they taste amazing! The sweetness of these brownies may vary. This will depend on the sweetness of apple puree and the beet. I dusted these with pink powdered sugar. 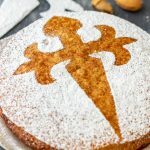 This is not necessary, and you can simply serve them plain or dusted with white sugar. 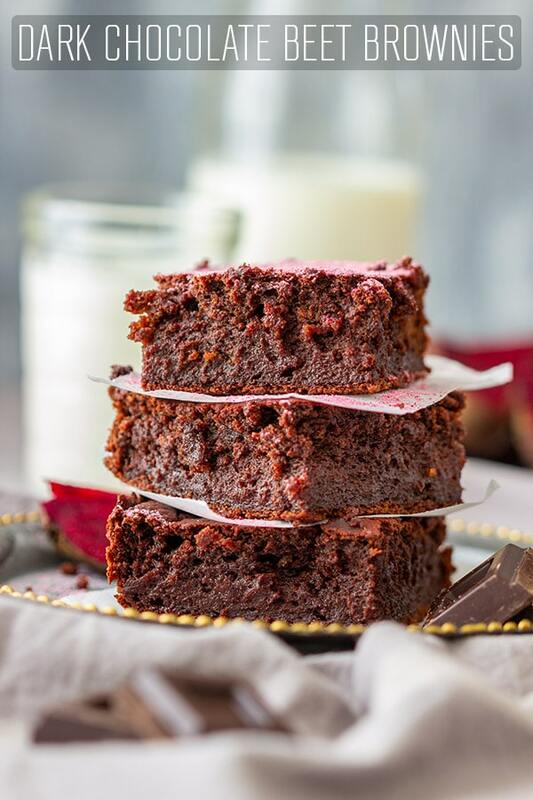 Make sure to use unsweetened natural cocoa powder to make these dark chocolate beet brownies. The baking time may vary. This depends on your oven but also on your taste. If you like them gooey then 40 minutes should be perfect. If not, cook them longer. Always check with a skewer to see their doneness. I buy ready-cooked beet from my local supermarket. This saves me time cooking it and peeling it and I don’t have to worry about my hands turning purple. However, you can also buy fresh beet and cook it yourself, if you like. 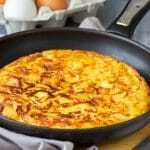 Use apple puree or thicker (smooth) apple sauce. P.S. 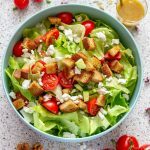 The prep might take even less than 20 minutes, especially when you make this for the second, third time! Also if you are good at multi-tasking, then you can do step one and two at the same time: prep the beets while waiting for the chocolate to melt. 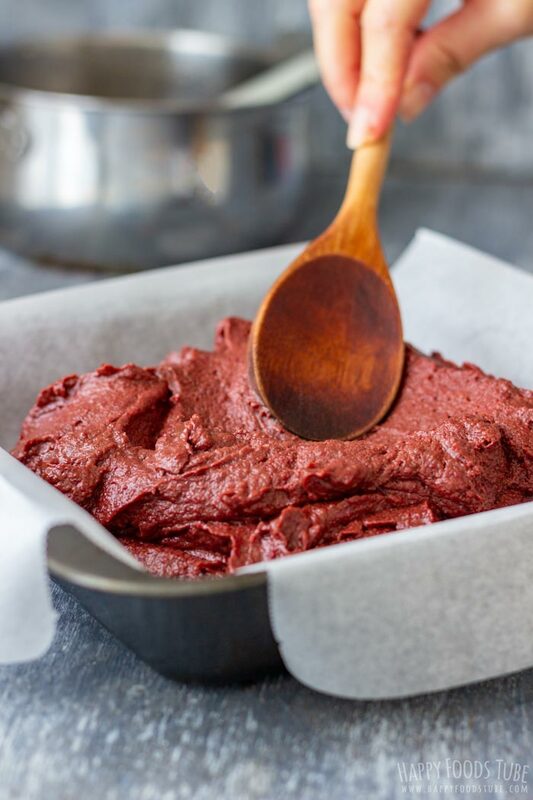 Want to see how to make Dark Chocolate Beet Brownies? Watch the video! 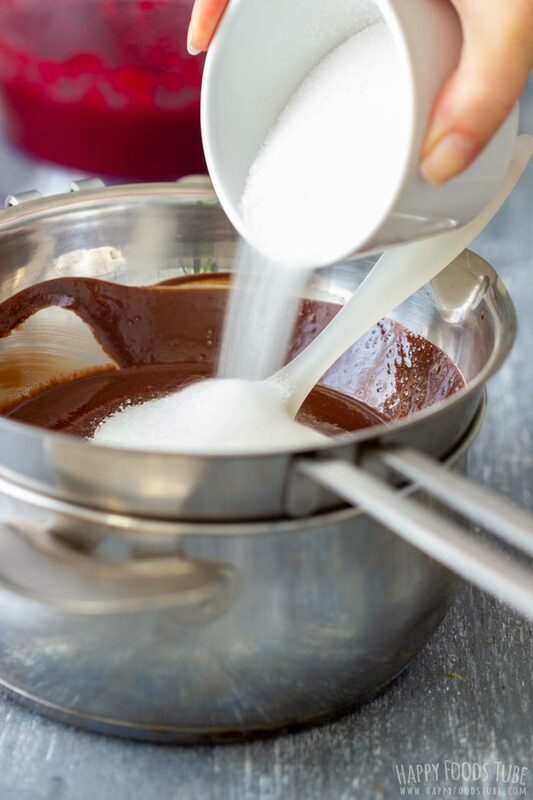 Finely chop the chocolate and melt it altogether with butter in a double boiler. When ready, stir in the sugar and set aside. 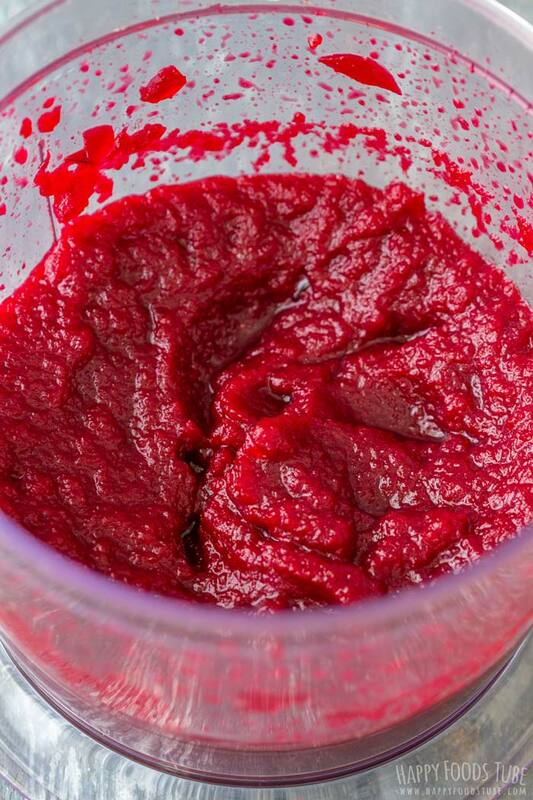 Cut the cooked beet into smaller pieces and transfer these into a food processor. Process until the beets turn into a puree. 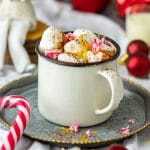 In a large mixing bowl, combine flour, baking powder, baking soda and cocoa powder. Mix well with a wooden spatula. Pour in apple puree, melted chocolate and pureed beet. Mix together with a wooden spoon. Pour the batter into a brownie pan (greased with cooking oil/butter or lined with baking parchment). Bake in a preheated oven at 375°F/190°C for 40 minutes. After 40 minutes these brownies will be slightly gooey inside. If you prefer them done more, cook them longer. The best way to prevent brownies from sticking to your pan is using baking parchment. I always cut out 2 rectangles that cover the bottom and sides. 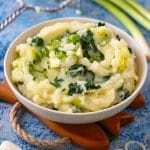 Use apple puree or apple sauce (not with chunks), unsweetened or low in sugar. I used a 7.5 inch square pan (19 cm) to make these brownies. These look moist and gooey, just how I love my brownies! 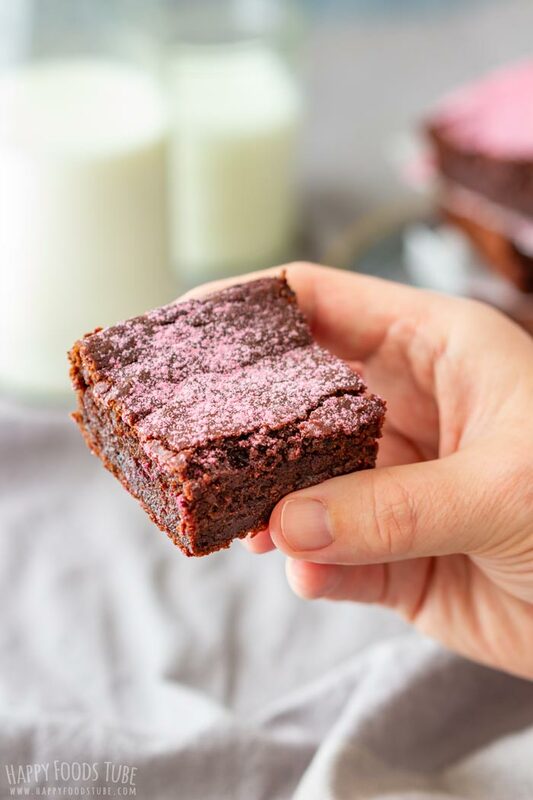 I also love beets and have been wanting to try beet brownies. This is going on my list (and I love the pink powdered sugar). 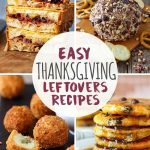 These are a great way to sneak some vegetables in. They look lovely and fluffy. 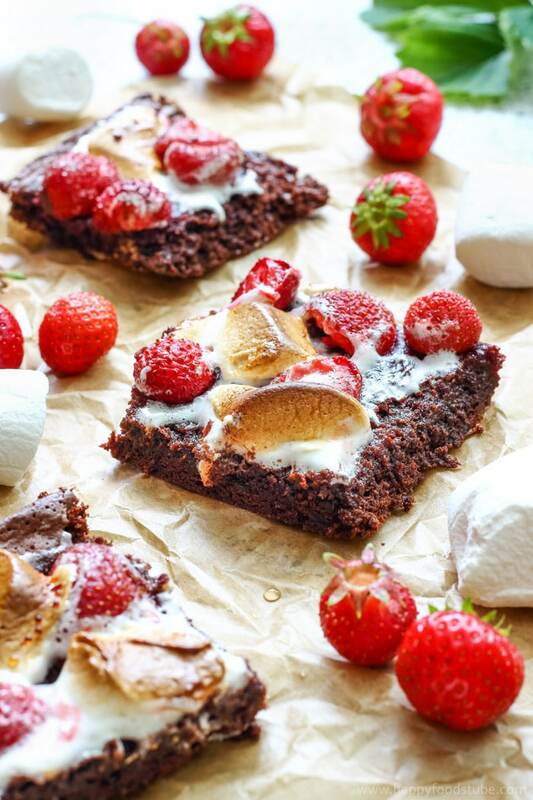 These look so moist and I love adding beetroot to the brownies too. I have got to look for that ready cooked beets at the store. These brownies looks delicious. Totally intrigued here! Looks devine without the guilt. Can’t wait to try!